Computer modeling of water flows in the Little Plover River region examined the potential effects of high-capacity wells. 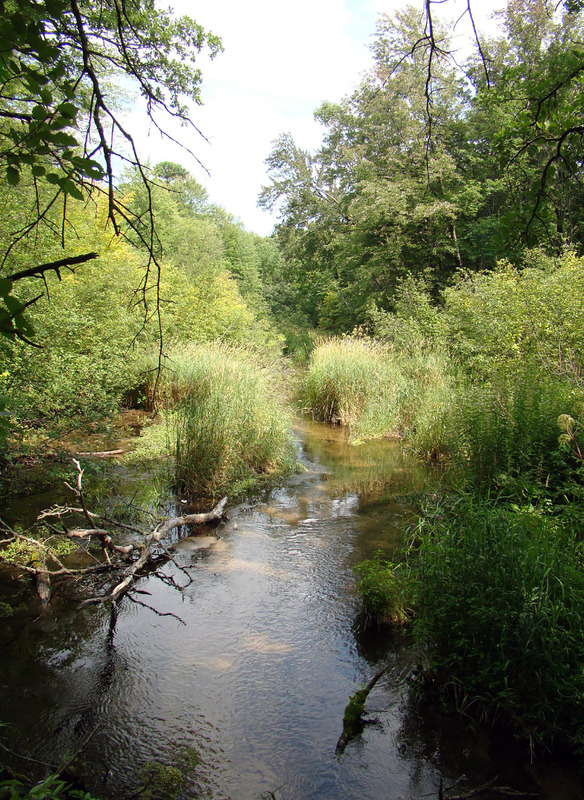 The Wisconsin Geological and Natural History Survey studied the role of high-capacity wells on water flow in the Little Plover River watershed. The Little Plover River has been a popular destination for trout angling. Even still, settling on a workable solution to the problem is not as straightforward as identifying it. In 2016, the Survey revealed its study of high-capacity wells in the Little Plover watershed, finding that the proximity of wells to to the river was meaningful. A year later, Bradbury and his team of researchers confirmed that wells are indeed reducing its flow. Since then, public and private sources have funded a project to the tune of $2.6 million to restore the river's flow using the Survey's groundwater flow model as a basis for the effort. Meanwhile, the DNR is using the model in a lake levels study in the region. Wisconsin Geological and Natural History Survey scientists use computer models to better understand and forecast groundwater budgets. Groundwater is any water that fills a crack, pore or space beneath the Earth's surface. It sustains springs, lakes, streams and wetlands, and in Wisconsin it also provides a large share of drinking and irrigation water. Precipitation is groundwater's only source, and about 20-30 percent of precipitation eventually becomes groundwater. A groundwater budget represents the balance between groundwater outflows — via springs, lakes and wells — and its natural replenishment by way of precipitation. When more water is drawn from an aquifer than is replaced, scientists consider the aquifer to have a groundwater deficit. Groundwater deficits can lead to lower levels in nearby surface waters, which often carry negative consequences for aquatic life and human activities. Building a groundwater model begins with understanding the geology and water resources of a particular place, and then converting that knowledge into a mathematical formulation that scientists can feed into a modeling program. This geological and hydrological information is then split into small parcels, much like pixels in a digital image. 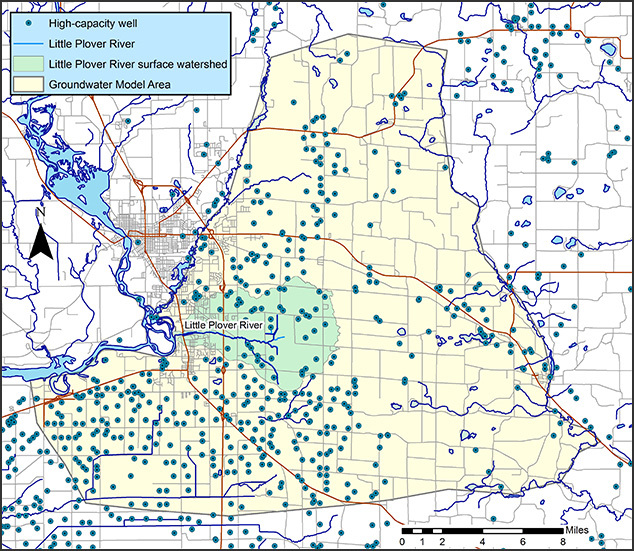 Together, these small bits of information form a regional groundwater picture computer models can use to produce maps that provide predicted water levels, flow rates and paths. Groundwater models are powerful tools because they are robust enough to forecast groundwater budgets based on large amounts of complex data while nimble enough to forecast small differences based on potential management scenarios. By forecasting groundwater budgets, scientists can help local communities make decisions about current and proposed water and land use. On the impacts of groundwater use in Wisconsin: "We have abundant water in most places compared to other parts of the world, but we do have some issues ...The issues are often a deficit in our water budget, and the deficit is something we can see because we see decreased base flow to springs, streams, lakes and wetlands. That’s the most obvious impact of groundwater use that we see in Wisconsin." On using a location's geology and water resources when building a model: "We look at the properties of rocks. We would investigate springs, for example, [and] measure flow in springs and streams. We would do a lot of what we call 'geophysics,' lowering different probes down wells to measure things about the rocks and water below the surface." On groundwater models using complex on-the-ground information to better understand water use impacts: "They integrate impacts from multiple stresses or multiple wells, so we can solve questions involving many, many wells at once … We get a complete water balance, we understand where all the water is coming or going, and the models are also a database of information." On using groundwater models to gauge water use over time: "One of the neat things we can do with the models [is] we can look back in time, and then we can add the wells and see how things have changed." On using groundwater models in water resource conflicts: "They're based on mathematical and physical properties, and so they give objective results [and] objective solutions. So often in these water resource conflicts, I see people arguing about pros and cons, and there's a lot of misinformation, and mistaken information sometimes, or opinions that can’t be backed up. Models are factual things, and we can put in the mathematics, and the mathematics don’t lie, so they give unbiased and objective solutions." On the use of groundwater models in decision-making: "Models are really … decision support tools for understanding the impacts of new wells, for understanding alternatives, for looking at these groundwater-surface water relationships, understanding where water comes from, from a spring or a lake, to a spring or a lake, and how changing the environment might change that flow."